Ming-backed turf-cutter Michael Fitzmaurice picked up transfers from all over the field to pip the FF candidate to the post. CO GALWAY-BASED turf-cutting campaigner and councillor Michael Fitzmaurice has claimed a win in the Roscommon-South Leitrim by-election, snatching victory from Fianna Fáil candidate Ivan Connaughton, who had been the favourite. Fitzmaurice, who was backed by MEP Luke ‘Ming’ Flangan’s organisation, picked up transfers from all over the independent-heavy field, and his election appeared all-but-assured from late in the afternoon. Labour polled disastrously, with John Kelly – a sitting senator, and relatively high-profile name in the race – picking up just over 2,000 first preferences. But Fine Gael put in a stronger than expected performance, with recently-elected councillor Maura Hopkins finishing ahead of Leitrim-based veteran Sinn Féin council member Martin Kenny. Early in the day, Fianna Fáil had been hoping Hopkins’ transfers would split their way, but by the time her votes were distributed Fitzmaurice was already too far ahead for Connaughton to catch. 5th count. #RSL14 . Conn 8863. Fitz 9211. 6th count. Conn 10083. Fitz 11722. #RSL14. Hopkins 8476. After greeting well-wishers and fellow candidates, Fitzmaurice was whisked around the PE hall for a round of quick media interviews. “For too long people have been wronged here in the West of Ireland,” was a typical quote from the soon-to-be TD. When you have the big party machines obviously it’s like the mouse and the elephant but I’m a grand big fella. We took them on and thank God we got vindicated. Putting on a brave face, Fianna Fáil leader Micheál Martin was refusing to concede defeat in the wake of the fifth count, telling reporters he had been involved in plenty of elections where the final result confounded everyone’s expectations. …I said we don’t have any seat to lose – because we didn’t have a seat in Roscommon-South Leitrim. Ming had the seat, he went to Europe, and Michael Fitzmaurice has now won… or is in a position to maybe challenge for that and be in strong position. Regarding his candidate’s poor showing in terms of transfers, he insisted Connaghton had picked up a “significant number” of votes from rivals. We haven’t been as transfer resistant as we were in the past, so I take some heart from what’s happening on the transfer front. Martin said there was “no question” of his leadership being under pressure as a result of the by-election loss. “Two weeks ago, if someone had told me that the tallies had been looking this positive I would be very, very happy. “When you say that he’s my candidate, I’m his candidate as well and myself and Michael have traveled many a road together — in fact, we organised 98 meetings around the country when we were on the turf-cutting, and I spent 98 days with this man in a jeep. I’m a townie and he’s a culchie, and between the two of us we’re starting to work it out. Now I’m a bit of culchie and he’s a bit of townie. Asked whether Fitzmaurice’s election could herald the start of a new political party, Flanagan said that whatever about the rigid form of a party “there does obviously need to be some sort of structure or form put on what independents represent”. He said his experience in Europe had given him some insight into how an alliance of like-minded independents could be run, and that TDs could be organised on a similar basis to the structures used by the political groupings in the EU Parliament. New #rsl TD Michael Fitzmaurice to RTÈ: "We gotta start boxing for Ireland." Independents Des Guckian, the anti-fracking campaigner, and Gerry O’Boyle, who was running under the ‘Land League West’ banner were eliminated early. Guckian received 902 first preferences, and O’Boyle just 82. Exiting after them was Tom Crosby, an Independent former mayor of Roscommon. Emmet Corcoran followed him out the door, after a strong showing — the 22-year-old Strokestown-based entrepreneur netting over 1,200 first preferences with a minimal budget. John McDermott, the Roscommon hospital campaigner, received almost 3,000 first preferences, out-polling Labour’s Kelly. 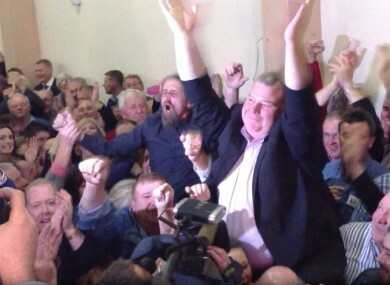 Email “Ming dynasty: Fitzmaurice upsets Fianna Fáil to take Dáil seat”. Feedback on “Ming dynasty: Fitzmaurice upsets Fianna Fáil to take Dáil seat”.